A partial US government shutdown over budget spending could continue right up to the opening of the next Congress on 3 January, a Trump aide has said. 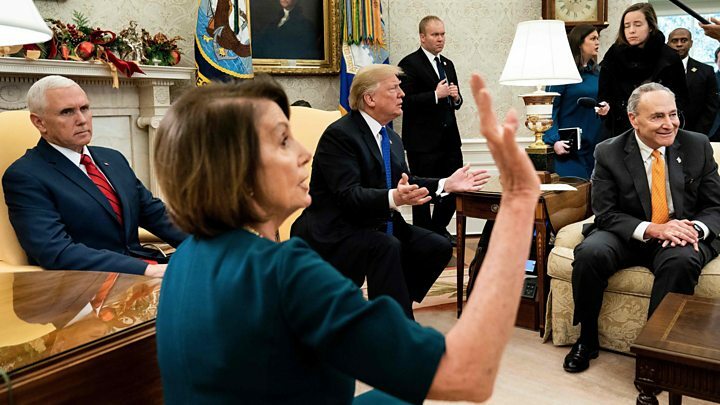 The shutdown began at midnight Friday after opposition Democrats resisted President Donald Trump's demand for $5bn (£4bn) for his Mexico border wall. Mr Trump's acting chief of staff, Mick Mulvaney, suggested Democrats were "beholden" to their left wing. A Democratic senator said his party opposed any funding for the wall. "That's correct," Sen Jeff Merkley told an ABC news interviewer when asked if his party was not going to approve any money for the Trump administration's project. "None." Earlier, the party offered a sum of $1.3bn for border security. Mr Trump himself took to Twitter on Sunday to defend his plans for the border with Mexico. What did Mulvaney say exactly? "It's very possible that this shutdown will go beyond the 28th and into the new Congress," Mr Trump's acting chief of staff told ABC. "This is what Washington looks like when you have a president who refuses to sort of go along to get along." In a separate interview for Fox News, he said he was waiting to hear from Senate Democratic leader Chuck Schumer about a new Republican offer, without specifying the sum. Speaking to ABC's This Week programme, Sen Merkley said a "30-foot concrete wall" and "30-foot steel spikes" were "not the smart way". Why can Trump not get his budget passed? His Republican Party controls both chambers of the outgoing Congress and the budget was indeed passed by the House on Thursday by 217 votes to 185. However, he needs to find 60 votes in the 100-seat Senate, where the Republicans currently have 51, so he needs to enlist the support of Democrats there. How is the shutdown playing out? Nine of 15 federal departments, including State, Homeland Security, Transportation, Agriculture and Justice began partially shutting down after funding for them lapsed at midnight (05:00 GMT Saturday). 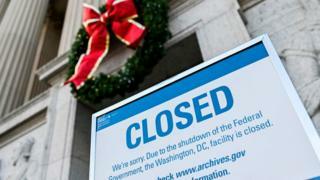 Hundreds of thousands of federal employees will have to work unpaid or are furloughed, a kind of temporary leave. The current Congress reassembles on Thursday after the Christmas holiday. On 3 January, new members of Congress will be sworn in, having been elected in November's mid-term elections. From that point, Democrats will enjoy a majority in the House of Representatives. Mr Trump has said the shutdown could last a "very long time".